Some anti-cancer drugs are encapsulated to allow gradual release, spreading their effect over a longer time. For example, one formulation of the chemotherapy doxorubicin (the FDA-approved drug Doxil) encloses molecules of the drug in fatty nano-spheres called liposomes, which allows the drug to circulate longer in the blood. However, the use of liposome "capsules" often comes with side-effects. Unfortunately, liposomes often end up in skin cells, resulting in rash and even lesions. These side effects can be "dose-limiting," meaning that the amount of medicine that can be used is limited by the severity of side-effects. If researchers could decrease the side-effects of liposome use, doctors could use higher doses of these drugs, perhaps leading to better cancer control. 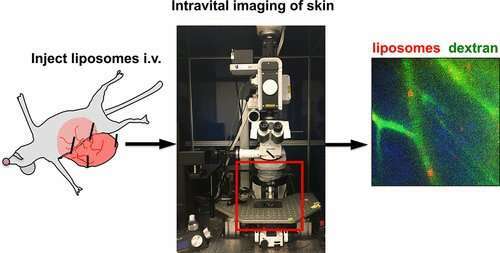 A University of Colorado Cancer Center study published today in the journal ACS Nano describes the use of cutting-edge microscopy technology to visualize how liposomes escape from blood vessels into surrounding cells in a living mouse, offering clues that may help researchers design better drug delivery systems - both to keep dangerous drugs from accumulating in skin cells and, oppositely, to take better advantage of this side-effect to specifically deliver drugs to these cells when needed. "We know about the dose-limiting side-effects of liposomes, but no one had looked at what happens to the liposome over time in the skin - how they get there and what happens to liposomes after injection," says Dmitri Simberg, PhD, investigator at the CU Cancer Center and the paper's senior author. For the current study, working in the CU Cancer Center Advanced Light Microscopy Core, co-authors Dominik Stitch, PhD, and Radu Moldovan, PhD, implemented a new technique known intravital multiphoton in vivo microscopy that enabled the team to watch fluorescent-tagged liposomes in real-time after injection. Very basically, liposomes would glow and the team would watch them. "Surprisingly, we saw that even liposomes with a protective coating meant to make them invisible to the immune system start exiting blood capillaries and sticking to skin cells within five minutes of injection," Simberg says. "Around three hours, we saw many skin cells loaded with liposomes and even seven days after injection, liposomes were still visible in the skin." The group wondered if skin cell accumulation was due to liposomes losing their protective coating. "Nope. We added more coating and it didn't help," Simberg says. They also wondered if blood cells known as neutrophils, which are known to migrate from blood vessels into tissues, might be transporting liposomes from blood to cells. "Nope. Even when we depleted neutrophils in our models, there was no effect." Simberg and colleagues also tried turning off the complement system - a facet of the immune system responsible for clearing microbes and damaged cells - thinking that this complement system might be attacking, transporting or otherwise accidentally pushing liposomes from blood to cells. "Again, there were no differences," Simberg says. Eventually, the goal is to understand the mechanisms by which liposomes leave blood vessels and are picked up by skin cells, allowing researchers to design better liposomes without skin toxicity. The current study rules out important possibilities: Liposomes are not traveling through pores in the capillaries, they are not being transported by neutrophils, they are not accumulating due to loss of protective coating, and they are not being harassed by the complement system. Beyond that: "At this point, we lack a mechanism for how liposomes are taken up by the skin. But we can see the dynamics - it happens very fast and it lasts surprisingly long," Simberg says. The group plans to continue gathering data on the dynamics of liposome transport while applying for additional funding that will allow more focused exploration of the mechanisms that make transport possible.